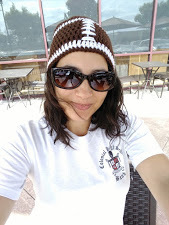 This hat pattern was courtesy of Sarah over at Repeat Crafter Me. The hats were supposed to be snowman (and woman) for my little cousins, Madison and Tyler, but I started them about a month ago – when it would have been fun to sport around a snowman with the holidays upon us, but now that the holidays are over, I figured it’s best just to make them as is so they can be worn whenever and not specific to winter. If you’d like a hat as a snowman, please message me. I’d be happy to create it for you! 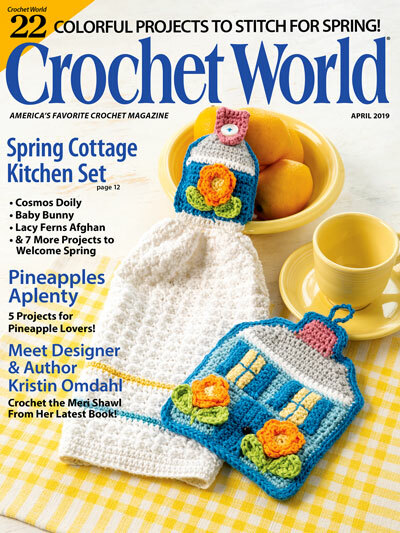 I followed the pattern for the preschooler size, and added the extra round of single crochet as recommended by Sarah. 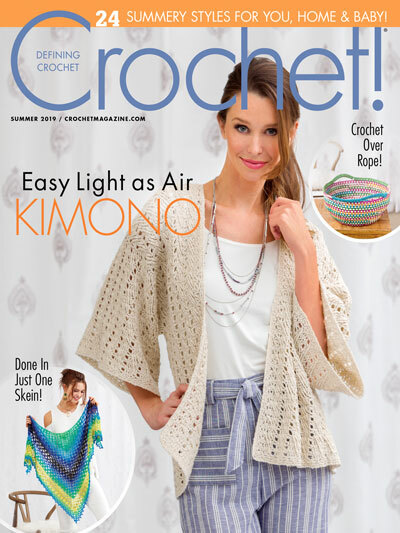 Although, not very big, the double crochet makes it work up much faster! 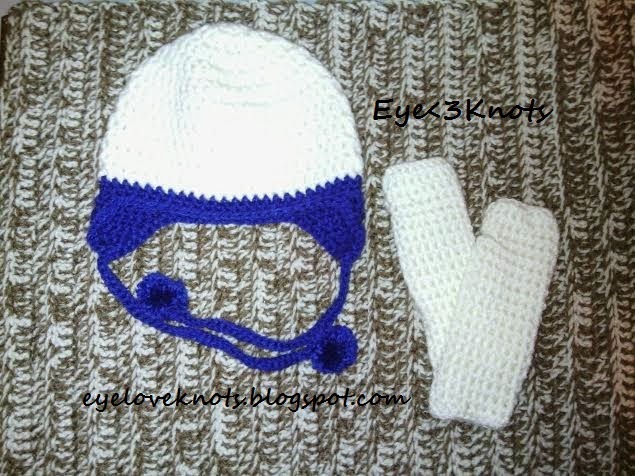 And since it’s made using two strands of yarn at one time, it makes it nice and thick to keep little ones heads warm. 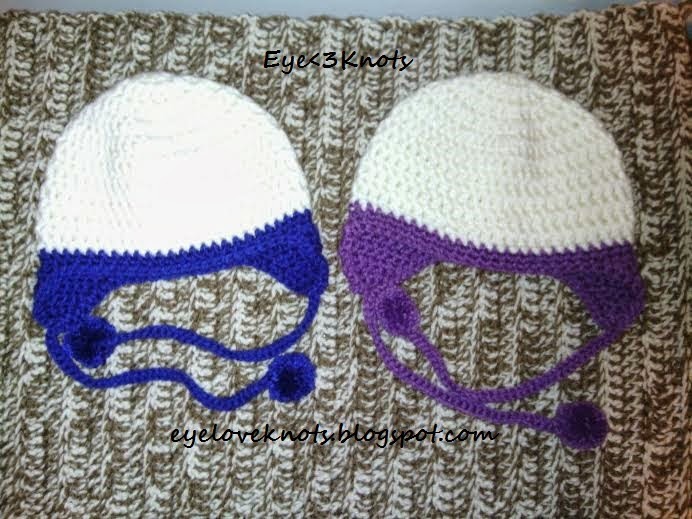 The hats have a crocheted chain attached and have a small pom pom on the ends. This can be omitted if you prefer, or in a different color! Feel free to message me for adjustments. I chose to use Deborah Norville’s Everyday Soft yarn in White, and I Love This Yarn in Royal Blue, and Red Heart Super Saver in Lavendar. They are 100% acrylic yarn but nice and soft. You can click any of these links to see what other color options are available! The fingerless gloves pattern was courtesy of Corina at Stitch11. 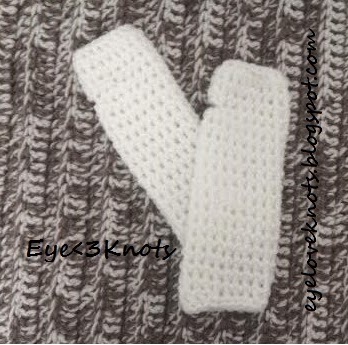 These measure approximately 3″ wide by 8″ long, and should fit a toddler 2 – 4 years old. Quick, and easy to work up! Each pair took me less than an hour to put together. 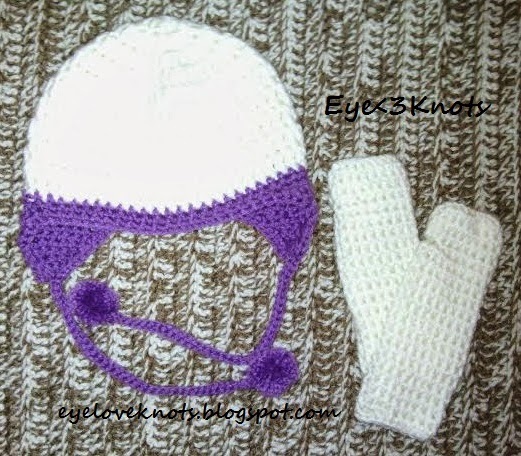 I had purchased two balls of the white yarn, and with it I was able to make both hats and two pairs of the fingerless gloves with a tad bit left over. I will be sending these out to the Lindhorns within the next few days and cannot wait to get pictures of Tyler and Madison wearing them! Updates to come!